Updated version of Hidden & Dangerous and its expansion with many improvements and fixes. 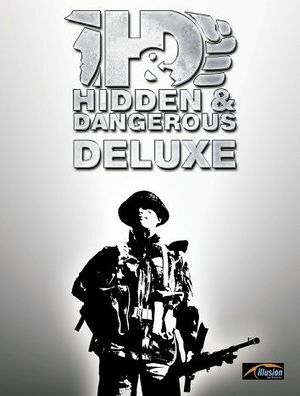 Re-released as a free download to promote Hidden & Dangerous 2. Uses Custom CD check, must be present even during gameplay. CD is expected in same drive letter used to install game. v1.50, no patch to v1.51. Bundled with Hidden & Dangerous. v1.51. Retail version not compatible with freeware re-release. Widescreen resolutions have a stretched 4:3 aspect ratio. Two sliders named "Music volume" and "Sound volume". Some enemies can fire their entire clip of ammo in one frame, resulting in what seems to be a shotgun-effect that can quickly wipe out the team. This is caused by enemy reaction time falling below a certain threshold, which happens on Hard difficulty, and applies to all weapons. Only known workaround is to play on Medium difficulty. This requires restarting the campaign, or downloading a saved game with prior missions completed. This page was last edited on 11 April 2019, at 23:17.